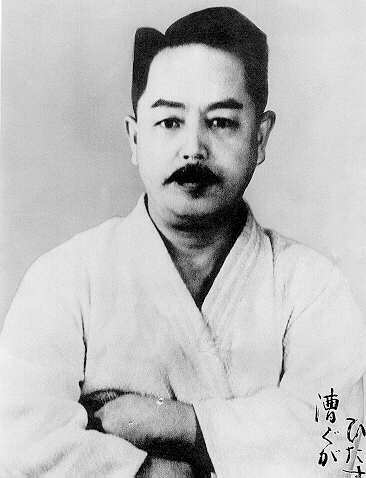 The founder of Shito-Ryu Karate-do, Kenwa Mabuni was born on, November 14, 1889 in Shuri, Okinawa. He was the 17th generation ancestor from one of the bravest warriors of the Ryukyu kingdom, Kenio Oshiro. Kenwa Mabuni himself was a physically weak child; however, his family members often told him stories about his famous ancestors and he dreamed of becoming physically strong. At the age of 13, Kenwa was accepted as a student at the school of the famous Karate-do master, Anko Itosu, who also lived in Shuri. Kenwa Mabuni trained every day, even during typhoons, and within seven years he learned the art of Shuri Karate-do or Shuri-te. When Kenwa was 20 years old, he began to study the art of Naha-Karate or Naha-te with Grandmaster, Kanryo Higaonna. Later both of these major directions of Karate-do of Okinawa formed a basis for Shito-Ryu Karate-do style created by Kenwa Mabuni. After graduating high school and being discharged from the army, Kenwa Mabuni worked as a police officer for about 10 years. His job required him to visit different parts of the country and he had an opportunity to study other forms of Karate-do with little known local masters. He also studied the ancient art of Ryokan Budo. At the beginning of the 20th century, Karate-do became wide spread. In 1910 it was included in the school program as a separate subject, which meant the official recognition of Karate-do. But the Karate-do education still lacked the system. The majority of masters paid most attention to the physical training of body, wrists, elbows and fingers, using Makiwara and sandbags. There was no standard Karate-do uniform, as it exists now. During these years, Kenwa Mabuni began his teaching activity. Together with his master, Mabuni created a school of Karate-do for the study of this martial art. In 1918, Kenwa Mabuni started to popularize Karate-do and many well-known masters helped him. He organized meetings in his house which were attended by Gichin Funakoshi, Choju Oshiro, Choshin Chibana, Anbun Tokuda, Shimpan Shiroma, Seicho Tokuumura and Hoko Ishikawa. Also in 1918, he had the honor to demonstrate Karate-do at the Okinawa Middle School in the presence of Prince Kuni and Prince Kacho. In 1925 Kenwa Mabuni, with other masters organized, "Okinawan Karate-do Club", which brought to life his old dream of establishing a permanent training dojo. Many famous Karate-do leaders like; Juhatsu Kyoda, Chojun Miyagi, Choki Motobu, Chomo Hanashiro, Choju Oshiro, Choshin Chibana, Wu Xian Gui (Go Kenki (Master of Chinese-ken trained in this first dojo)). Kenwa Mabuni and Chojun Miyagi became the permanent instructors of the club as the youngest members. At this time, instructors concentrated on physical training and kumite practice. When a student asked the teacher to explain something, the teacher gave him an opportunity to attack him and answered by demonstrating various defense techniques. The training was just a continuous practicing of the same techniques. All masters had varying techniques but the main teaching method was the same - practical trainings. The year of 1927 was extremely important for Kenwa Mabuni. He met Jigoro Kano, the founder of modern Judo, who arrived in Okinawa to open a new judo dojo. Chojun Miyagi and Kenwa Mabuni had an opportunity to demonstrate and to explain Jigoro Kano the techniques of Karate-do. Jigoro Kano was inspired by Karate-do and considered it the ideal Budo art for both defense and attack. He talked about the necessity of wide spread of Karate-do in Japan. Being touched by these inspirational words, he decided to move to Osaka and to devote himself to development and popularization of Karate-do Shito-Ryu in Japan. As Karate-do was an original Okinawan Art, Kenwa Mabuni faced a difficulties in the teaching of Karate-do when he moved to Osaka. There were no public training dojos, so Kenwa tried to popularize Karate-do within police departments and Buddhist temples. Mass audiences had some difficulty accepting Karate-do, especially Katas and frequently called it "fists dance". Kenwa Mabuni worked day and night, trying to invent ways of popularizing Karate-do. He even practiced Tame Shivari - the breaking of bricks and boards, showing the public the force of the new martial art. Karate-do was sometimes used during usual fights, which contradicted to its ideology and reputation. Despite all these difficulties, Kenwa Mabuni was determined to teach Karate-do. His titanic efforts finally succeeded, and as a result, the organization called, Dai-Nihon Karate-do Kai was created in 1931. Subsequently, this organization was renamed into Nihon Karate-do Kai. Many of the participating members of the Dai-Nihon Karate-do Kai were direct students of Kenwa Mabuni. After World War II, Karate-do clubs began opening one after another in schools and universities. They organized tournaments and prepared the National championship of Japan. 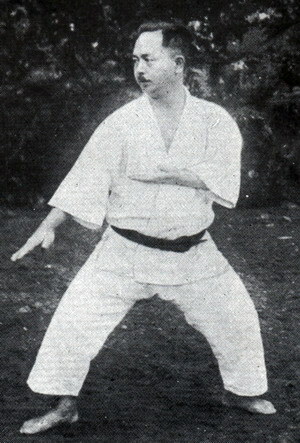 During the difficult post-war years, Mabuni helped to reconstruct Japan by devoting himself to the development and wide spread of Shito-Ryu Karate-do. Unfortunately he had no time to bring his plans to life as he died on May 23, 1952. Shito-Ryu Karate-do, created by Kenwa Mabuni, combined the features of Shuri Karate of Master Itosu and Naha Karate of Master Higaonna. The name Shito-Ryu is formed from the first characters of the names of his Masters ("Ito" - old Chinese hieroglyph "Shi", "Higa" - old Chinese hieroglyph To). While teaching his students and explaining the basic differences between schools Itosu and Higaonna, Kenwa Mabuni paid the most attention to Kata. He believed that Kata, which combine both attack and defense techniques, are the most important part of Karate-do, and that it is necessary to understand the meaning of each movement in the Kata and to perform the Kata correctly. Kenwa Mabuni was the first to introduce the concept of Bunkai Kumite and Hokei Kumite, which demonstrated the purpose and showed the correct use for each Kata. The final result of proper Kata and Kumite training is the ability to apply Karate-do techniques in free Kumite. Practice of Kata also helps to transmit the knowledge encoded in Kata to the subsequent generation. Shito-Ryu Karate-do, unlike other Karate-do styles, have many more Kata. According to Kenwa Mabuni, a student ignoring Kata and practicing only Kumite, will never progress in Karate-do and will never understand its meaning.